The Tilt-a-Rack Scooter Carrier makes transporting motorized wheelchairs and scooters effortless. 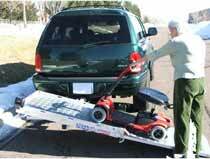 The Tilt-a-Rack Scooter Carrier is easy to install and use. There are no electronic components. Gravity and balance work for you! Perfect for full-sized scooters and power chairs. 32" x 60" usable space. All Aluminum Construction makes the 500ARV the lightest choice in it's category. usable area: 32" x 60"